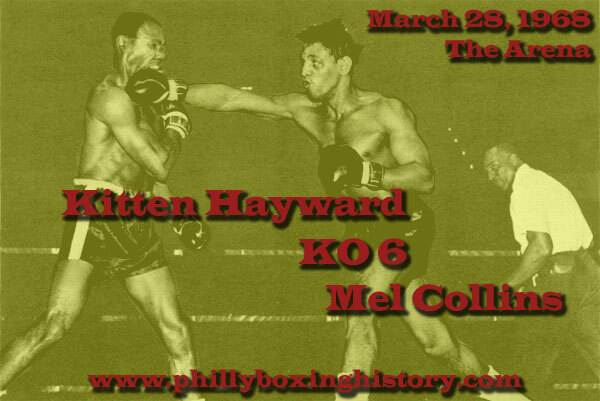 Stanley "Kitten" Hayward boosted his professional record to 25-3-2 with 13 KOs on this day in 1968 when he stopped Trenton's Mel Collins in the 6th round of their scheduled ten rounder at the Arena. The bout was fought in the jr. middleweight class with Kitten weighing 155 pounds to Collins' 152. Hayward, the fourth-ranked welterweight in the world, sandwiched this over-the-weight victory between two 10-round draws as he continued to build toward his shot at the 154-pound crown, which would come one year later. Kitten had to beat Johnny Brooks and Emile Griffith to get the title fight, which he lost by decision to Freddie Little in Las Vegas.